Welcome to the last day of 2013! Let me guess, you need a cocktail? This one has a bit of champagne, a bit of antioxidant, and a bit of the holiday season. And only three ingredients. Cheers to that! Soak four rosemary sprigs in pomegranate juice for one hour prior to mixing cocktails. Discard sprigs and pour 3 oz of juice into four cocktail glasses. Top each with 5 oz prosecco and a sprig of fresh rosemary. Enjoy! There are quite a few "lucky" New Year's foods. This salsa incorporates two of those! Pomegranates are thought to bring prosperity and health. With the seeds having high amounts of antioxidants, I don't think you will need the luck once you eat these babies! Beans are also considered lucky and may bring prosperity to those who eat them on New Year's Day. These gems also deliver 15 grams of fiber per cup, which will help you maintain a regular digestive system and lower your risk of heart disease. ** Fill a large bowl (or sink) with water. Gently slice the pomegranate into two halves (go slowly and make your cut so that it does not cut through seeds). Submerge each half in the water and use your hands to gently peel away the skin from the seeds. The seeds will sink in the water and the skin will float. Voila! No mess, no stained hands or clothing! Combine black beans, pomegranate seeds, green onions, and jalapeno in a medium bowl. In a separate bowl, whisk together oil, lemon juice, pomegranate juice, salt and pepper. Pour liquid mixture over salsa mixture and toss to coat. Cover and place in the refrigerator for one hour (or overnight) prior to serving. Just before serving, stir in feta cheese. Serve with tortilla chips for dipping, or on a piece of fish. This is a fun twist on a peanut butter kiss cookie. Just in time for the holidays! Go for the dark chocolate kiss- it makes all the difference. Preheat oven to 350 degrees. In a medium bowl, combine flour, baking powder, baking soda, and salt. In a larger bowl, beat together nutella, butter, 1/2 cup white sugar, and brown sugar. Continue to beat for 2-3 minutes, then add egg and vanilla extract and mix well. Gradually add dry ingredients to wet and mix well. Prepare two baking sheets with parchment paper. Roll 2 Tbsp batter into a ball, then roll in remaining 2 Tbsp white sugar. Place balls 2" apart on the baking sheets. Bake for 10 minutes and remove from oven. Gently press a kiss candy into the center of each cookie. Allow to cool for 5 minutes prior to transferring to a rack to cool. This is another fun food gift! I like chickpeas all by themselves, but this jazzed up version is a nice change from the ordinary! They can be eaten straight-up, or added to a salad or pasta dish. Delish! Chickpeas are a great source of fiber and plant-based protein! High in folate and other phytonutrients, these filling little beans may lower your risk of heart disease. Now that's a holiday gift worth giving! Combine water, oil, vinegar, mustard, garlic, salt, pepper, and thyme in a two cup jar. Shake well to mix. Add chickpeas and shallot, cover and shake to coat. Place container in the refrigerator for 24 hours prior to serving or gifting. Here's my first food gift of the holidays! A tasty drink mix that can add some spice to the winter weather. A Bloody Maria is basically a Bloody Mary with tequila added instead of the traditional vodka. Your recipient could also omit the alcohol for a spicy sipper on the rocks instead! Combine all ingredients in a large jar, except for jalapeno and onion. Shake to mix. Add jalapeno slices and onion to a small food processor. Chop finely, then add 1/2 cup of tomato juice mixture and mix until a puree is formed. Return mixture back to jar, shake to mix. Place in refrigerator overnight prior to gifting. Wrap with a small bottle of tequila (jalapeno infused is highly recommended) and a fresh lime. What is the best gift to give someone who is starting to make healthy changes in his/her life? What's the second best gift? Something that supports their efforts, without saying "you need to do something ASAP". 1. A new water bottle. With a straw. Because a straw encourages drinking. And we all know that water is essential for living a healthy lifestyle. This one is insulated, so it will keep your water cool and it won't sweat and leave a puddle on your desk! 2. Sport earbuds. I just received a pair of these myself since my wee babe destroyed my other ones (she didn't mean to, I'm sure). These are great- they have great sound and they stay in place. And they're purty and come in many colors. 3. A bountiful basket. This co-op serves many many locations. A basket of fresh goods is delivered to a central location weekly, and you pick it up and enjoy! The best part? It's a surprise what will be in your basket each week! It encourages trying new fresh foods. Love it. 4. A 4 cup food processor. I use mine at least three times a week. It's perfect for little processing jobs around the kitchen. And the colors that it comes in makes it easy to find one that everyone will enjoy! 5. A great new hat built for winter exercise. Like the ones at Sauce Headwear. Check out their new styles and patterns! Sure to please. If banana bread and coffee cake had a love child, this would be it. A light taste of banana, all the strudely (it's a word) goodness of coffee cake. Enjoy! Preheat oven to 350 degrees. Spray a bundt pan generously with baking spray. In a large bowl, beat mashed bananas until pureed (you may also use a food processor if you wish). Add in butter, sugar and vanilla and beat until well-mixed. Add eggs, one at a time, and mix until combined. Beat in sour cream. In a separate bowl, stir together flour, baking powder, and baking soda. Add dry mixture to wet, 1/2 cup at a time, beating until just combined. In another bowl, mix together brown sugar, flour, and cinnamon from strudel mixture. Add in chopped butter and use your fingers to combine to form coarse crumbs. Pour half of the batter into the greased pan. Sprinkle half of strudel mixture onto the batter. Pour the remaining batter into the pan and top with the remaining strudel mixture. Place pan on the center rack of the oven and bake for 55-65 minutes, or until a toothpick inserted into the cake comes out clean. Remove from the oven and allow to cool for 45 minutes before gently transferring to a serving plate. Cut into 12 equal pieces and serve. Following a flexitarian diet means consuming MOSTLY plants and plant-based foods. However, there is the occasional place for a small amount of animal product. Which I think is important. The all-or-nothing approach is the demise of many people's healthy lifestyle attempts. And it leaves room for a bit of fantastic smokey flavor from bacon. Opt for the nitrate-free stuff. The quinoa in this chili adds great texture and actually thickens it a bit. In a great stick-to-your-ribs sort of way. Perfect for a chilly day. Like the ones we have ALL been having lately. *Note: here in my neck of the woods it has not reached over 0 (that would be ZERO) degrees in THREE DAYS. Everyone has their struggles. This is mine. Heat a large soup pot over medium-high heat. Add bacon and saute until crisp. Add onions, garlic and peppers and saute until softened, 3-4 minutes. Stir in remaining ingredients, except for cilantro, and heat on medium-high to a boil. Reduce heat to medium-low and continue to cook for 30 minutes, or until quinoa and vegetables are cooked through. Stir in cilantro and serve immediately. Forget the Chinese takeout! This is a quick and easy dish for a busy weeknight. The sauces used in Chinese restaurants are loaded with sugar (among other things)! Whip up this quick frittata for that Asian flavor, without the added "stuff". Load it up with additional veggies if you desire! In a cast-iron skillet, heat olive oil over medium-high heat. Stir in carrots, mushrooms, and green onions. Saute until carrots are softened, 4-5 minutes. Add in broth rice and peas. Stir well, making sure that edges of skillet are lightly greased with oil. In a small bowl, whisk together eggs, egg whites, milk, pepper, soy sauce, and hot sauce. Pour egg mixture into skillet and make sure that vegetables and rice are evenly distributed. Cook on medium on the stovetop for 5 minutes. Transfer skillet to the oven and continue to cook for ~20 minutes, or until set. Remove from oven and cut into 6 even pieces. Serve immediately. There is nothing like a warm drink to solidify the holiday spirit. But your choices are rather limited if you are avoiding dairy and don't want a ton of sugar. You could always go with tea. But when you want something rich and creamy? This steamer is a winner. A blender eliminates the need for a milk steamer. Combine all ingredients in a small saucepan on the stovetop. Heat to a boil, stirring continually. Transer contents to a blender and blend until foamy, 30 seconds or so. Serve immediately in two mugs, sprinkled with shredded coconut if desired. Did you stuff yourself silly over the past few days? Are you ready for a nice, warm healthy meal? Make extras of the veggie-filled winter soup and freeze it for a quick, easy, and nutrient-packed meal for a busy night this holiday season. The spaghetti squash replaces the traditional pasta found in a minestrone and provides great texture- and filling fiber! In a large soup pot, heat olive oil over medium-high heat. Add garlic and onion and saute until fragrant, 3-4 minutes. Add remaining vegetables (including spaghetti squash) and saute for an additional 2-3 minutes. Stir in broth, tomatoes, beans, red pepper flakes, black pepper, liquid smoke, and balsamic vinegar. Bring to a low boil, then reduce heat to medium-low and cook for 10-15 minutes, or until vegetables are softened to your desire. Serve immediately! Bringing an appetizer to a holiday meal can be a tough thing to do. I mean, you don't want to trump the meal. It should be light enough so you're not weighed down before your meal, but it should be satisfying enough at the same time. Many of my patients and clients say that they will bring a veggie tray to the holiday meal, since that is something that many big spreads are missing (but not YOURS of course). 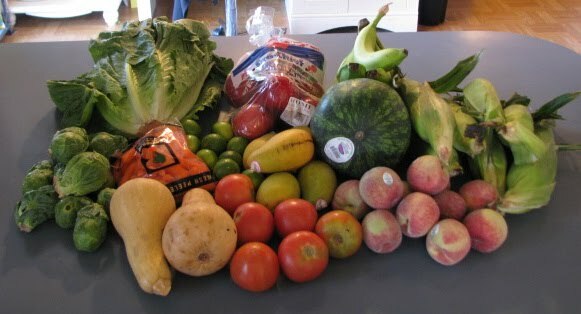 But many people won't just grab a handful of raw veggies and go to town (but not you of course). So how about something to serve them with? Something that pleases everyone? Something LIKE ranch dressing with less fat, more protein and fiber, and all the flavor. In a large food processor, combine chickpeas, tahini, salt, pepper, celery salt, celery seed, and garlic powder. Mix until chopped and combined. Add shallot, vinegar, and sour cream, and continue to mix until a smooth puree is formed. Add in chopped herbs and mix until just combined. Place in a covered container in the refrigerator for at least 2 hours. Serve chilled. Some of my past Thanksgiving dessert creations...... all delicious and worth repeating. Check out my Mini Maple Cheesecakes with Gingerbread Crust and Caramelized Pecans and Baked Caramelized Apples that I'm bringing this year! I swear this is my last pumpkin recipe of the season. Wee babe approved- minus the chocolate chips. What??? She spits them out. I have given birth to a phenom. I know there are a few of you out there. You being females who do not like chocolate. But I've never met one in person, let alone shared blood with one. Preheat oven to 350 degrees. In a large mixing bowl, mix together butter, sugars, and pumpkin until smooth. Add in vanilla and eggs, adding one at a time, and beating until smooth. In a separate bowl, mix together flours, baking soda, pumpkin pie spice and salt. Add dry ingredients to wet until well combined. Fold in chocolate chips. Pour batter into a 9 x 13" greased baking dish and spread evenly. Bake for 20-22 minutes, or until a toothpick inserted into the center comes out clean. Allow to cook before slicing into 12 even slices. Spaghetti squash is relatively low in carbohydrates, especially when compared to the same amount of pasta (about 1/3). AND it's naturally gluten-free and high in fiber. Pair those nutritional bonuses with a light yet flavorful alfredo sauce, and we have a WINNER. *To cook spaghetti squash in the microwave, slice off ends, then slice squash in half lengthwise. Remove seeds and pulp. Use a sharp knife to piece the outside skin of the squash in several places. Place half of the squash in a microwave-safe baking dish and place 1/2 cup water in the "hole" in the squash. Place the remaining half of the squash on top, so that the insides are together. Transfer dish to the microwave and cook for 12-15 minutes, or until flesh is softened. Allow to cool for 5-10 minutes, then use a fork to remove strings of squash. While squash is cooking, heat olive oil in a large skillet over medium-high heat. Add garlic and saute until fragrant, 2-3 minutes. Add sun dried tomatoes and pepper. Add milk and broth and use a whisk to combine. Continually whisking, add flour, 1 Tbsp at a time. Allow flour to be absorbed into the liquid before adding more. Continue to cook and stir until mixture is thickened, 10-12 minutes (or more). When sauce will coats the back of a spoon, add Parmesan cheese. Cook and stir for an additional 3-5 minutes. When sauce is desired consistency, add spaghetti squash "noodles" and use tongs to toss and coat. Sprinkle with parsley and serve immediately.